Any guide to rock climbing in Northern England must surely have extensive sections on Cumbria and the Lake District. This book does not. It focuses on the North East, from the Yorkshire Dales to the North York Moors and beyond into Northumberland. 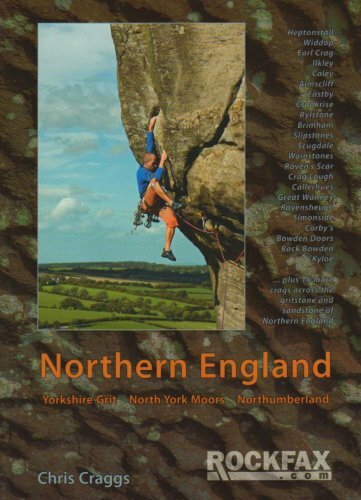 This is a selective guidebook to Northern England, which covers the Gritstone crags of Yorkshire, and sandstone crags of the North York Moors and Northumberland. The guidebook details 18 crags and over 1,200 gritstone routes in Yorkshire. The following crags are covered: Pule Hill, Shooter's Nab, Heptonstall Quarry, Widdop, Earl Crag, Ilkley, The Chevin, Caley, Almscliff, Eastby, Crookrise, Rylstone, Simon's Seat, Brimham Rocks, Eavestone Crag, Slipstones, Crag Willas, and Goldsborough Carr. 5 crags and 275 sandstone routes in the North York Moors are detailed, including the crags at, Scugdale, Wainstones, Raven's Scar, Highcliffe Nab, and Park Nab. 16 crags and over 730 dolorite and sandstone routes in Northumberland are detailed, including the crags at Causey Quarry, Crag Lough, Peel Crag, Callerhues, East Woodburn, Great Wanny, Sandy Crag, Ravensheugh, Simonside, Corby's, The Drake Stone, Bowden Doors, Back Bowden, Kyloe in the Wood, Kyloe out the Wood, and Berryhill. All the crags shown on detailed location maps and accurate descriptions. All the routes are illustrated on colour photo topos along with route symbols, crag tables and graded lists. Published by Rockfax in February 2008 this guidebook is in English text throughout. Number of pages is 360. Size is 150mm x 210mm (A5 format).